What was it like to ramp up at that first job? Did you find you had some blind spots that your job filled in? Were certain things more or less important than you anticipated? It was tough. I didn't get a lot of support from the other engineers, so I had to learn a lot on my own. If I ever ran into issues, usually they would just take the ticket themselves instead of helping me learn. At one point, I had almost no work, so I started taking online classes and working through programming books. I had never realized how important it was to have a team that supports you, which is definitely something I've looked for in every job since. Even as I move along in my career, I still want to be able to talk to my coworkers about issues that I am having without feeling like I'm wasting their time. However, I still feel like it wasn't a waste. It still enabled me to list myself as a software developer, have some actual production code that I could show, and really get my foot in the door. It's great to have a great job, but sometimes, especially if it's your first in a field, any job will do if you have limited choices. I used to write log parsing scripts all the time with Python. That's basically how I got started programming. In the past few years, I've been working almost entirely on application development. Recently my boss wanted to get the unique number of active users in a day and the unique number of active users within the past 30 days, in addition to an actual list of each of those users with the number of requests that they made to the system. There were a few issues. I had to keep in mind that there were sometimes anonymous requests, which I didn't want to add to my list since it didn't serve my purpose. I also noticed that there were some lines that didn't seem to contain a request at all, so I also had to account for that. Let's all hop on the regex party train! Thanks to the magic of regex, I can very quickly tell whether or not a line is a request from an anonymous user and skip that line. I can also skip a line if there is no IP address at the beginning, which occurs when there are usually requests that cover multiple lines. I also have a regex to match the date format that our logs are using. If there's a date, then I grab it; if not, then I can skip that line too. Now that we have valid lines, we can start populating this hash. If the current date exists as a key, then we increase the given user's request count. If it doesn't, then we instantiate the user/request_count hash with a default value of zero. That's actually the bulk of the work. After that it's just a matter of counting and generating a list of users for the past 30 days, then uniquing that list. If anyone has any comments on how I could make this better, I would welcome the feedback! Maybe I'm the wrong person to write this. After all, I only go to one or two conferences a year because I can't quite afford to travel as much as some people do. I check out some local conferences and that's about it. However, I'm inspired to write this because I just got back from RailsCamp East Coast and it was AMAZING. It reminded me of the same reason I love Burlington Ruby Conference and my first PyCon. Conferences (or in the case of RailsCamp, a retreat) set aside a few days to learn some new things and also to spend some time with other developers, building relationships. In a way, it's the best networking you will ever do. Going to loads of meetups and making a passing acquaintance with a lot of people might do you some good. Really getting to know a few people over a few days will do you a lot of good. I don't mean to dissuade anyone from going to meetups... 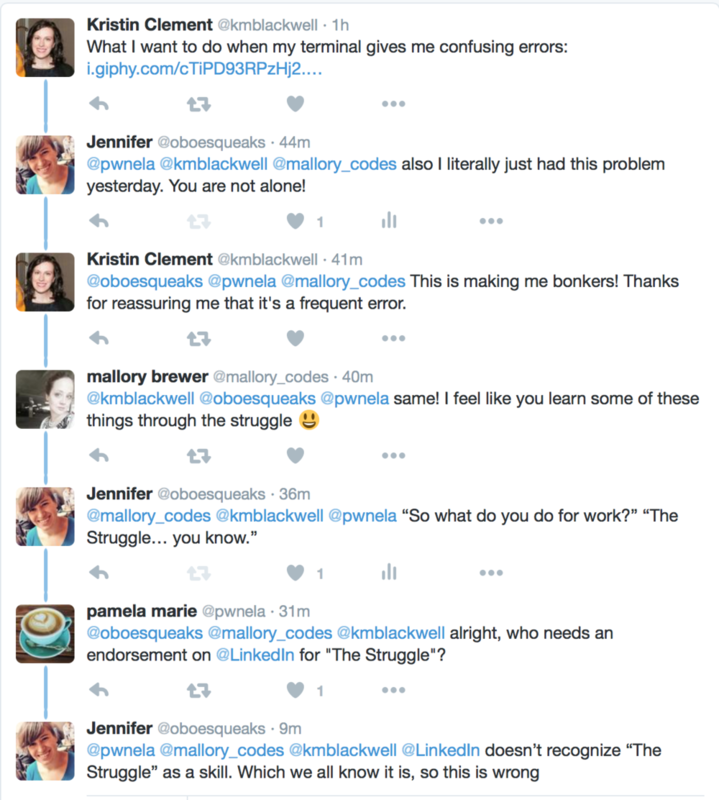 I have made so many wonderful friends through PyLadies Boston that I would absolutely vouch for and that I've helped get jobs. However, those relationships have formed over the course of years and sometimes you don't have that much time. If you are a junior developer who is trying to get a job, one of the best things you could do is go to a conference and do some heavy-duty bonding. If you can do a talk, that's even better. Anything to show how interested you are in whatever language/field you want to work in. Going to conferences won't guarantee a job, but it will likely increase the number of people who are willing to recommend you to other employers and increase your chances of getting a better job. If you are like me and a more experienced developer who is not looking for a job, conferences are still beneficial. I love my job, but I'm not going to be there for the rest of my career. When I am looking for a job, now I know even more awesome people who I would love to work with who also know me. This increases my chances of finding a job I actually enjoy since I have spent a significant amount of time with all of these people and have a better sense of who they are and what they value. TL;DR - Go to conferences (and RailsCamp). They are fun and valuable. I just started classes (working toward the CS certificate at BU Met) and my new big project at work is porting over a ton of code from Rails 2 to Rails 4, so I’m sure I’m about to have tons to write about. For today, here’s something I somehow just found out about: polymorphic routes in Rails. This is an awesome post that does a great job of explaining the intricacies of SSL and certificates in a pretty easy to understand manner. I’ve been a dev for years now, but someone else has always taken care of certificates, so I’m trying to learn and navigate this area right now. The terminal is fun. And it should also look fun (and be functional). I’ve been using Robby Russell’s Oh My Zsh for years now, but it still surprises me when people haven’t heard of it. I’m not going to go into a ton of detail as to why you should use it. Here are a few great posts that already do that. Nope, I’m mostly going to talk about how I have been adding a series of increasingly ridiculous emojis to my prompt. Why? Because if I am having a bad day, dammit if a 💩 doesn’t make me smile a bit. Right now I have a rainbow if I have a clean git repo, but I’m going to add a unicorn as soon as I can update my work computer. But then today, I decided it was taking up too much space and went back to an old standby: crunch. I modified it just a bit to change the icons (💩) and also to just display the current folder instead of the whole path. Though I’m sure the whole path can be useful to most people, my directory paths can sometimes get long and ridiculous, so generally a folder name does in a pinch. If I need to confirm, there’s always pwd. Try zsh. It has some other sweet features that are all useful, but my favorite thing is the themes and how much easier they make my day to day. I wrote a post inspired by Pamela’s tweets, so I obviously will share what she wrote about her own thoughts. My friend Pamela had some thoughts on code schools that she shared on Twitter today and I just have to echo them in every venue that I have. Code schools have long made me feel uncomfortable. It really started when a local code school started amping up representation at RailsBridge (free & community driven), obviously with an aim to drive RailsBridge grads to their boot camp. Considering the other TAs were there from companies that were interested in hiring, I thought it really sleazy that they were just using it to try to recruit more students. Add this in to women generally needing more validation before they feel comfortable calling themselves developers and that makes me feel even more uncomfortable. I try to do my part by running PyLadies Boston and Pamela runs Rails Girls Atlanta. Both of these groups exist to provide a community for women to learn to code, with no charge. I’ve actually had multiple women from my group start applying to jobs as developers and I know the same goes with Rails Girls. Community can make a big different and we need to let women know that you don’t have to shell out $$$ to become a developer. The community will help! PS - I have met so many wonderful and smart grads of code schools. This is not a knock on you! It’s a knock on this f’ed up industry. Why would you need to do this? Let’s say you have three production nodes: server1.test.com, server2.test.com, server3.test.com. In general, your production application (at prod.test.com) point to server1.test.com. But OH NO you totally messed something up on that node and you need to easily failover to server2.test.com. Easiest way? If they all have matching server host keys, you can just point prod.test.com to server2’s ip and you won’t get any errors. Otherwise, you’ll get loads. I also added a noop (no operation) mode to this script so it could be run as ./move_keys.sh -n and only print out the lines that it would run. This script is written to be run on the server you want to copy the keys from as your user, which means you have to have ssh access into each server. For each server in the list that is not the host, it backs up the /etc/ssh directory, rsyncs the keys over, restarts ssh, then removes the relevant lines for that server in the known_hosts file. echo "$SSHC -A $1 'sudo cp -r /etc/ssh /etc/ssh_bak_$(date +%Y%m%d%H%M)'"
$SSHC -A "$1" "sudo cp -r /etc/ssh /etc/ssh_bak_$(date +%Y%m%d%H%M)"
echo "sudo -E rsync -avz -e 'ssh -o StrictHostKeyChecking=no' --rsync-path='sudo rsync' $1 $2"
echo "$SSHC -A $1 'sudo service ssh restart'"
$SSHC -A "$1" "sudo service ssh restart"
echo "sudo ssh-keygen -f '/root/.ssh/known_hosts' -R $1"
I’ve gotten a variety of reactions when I’ve told people that I drink Soylent. Usually it’s gentle mocking or ‘BUT WHAT DOES IT TASTE LIKE???’. Both of these reactions make sense… on some level, I think I’m a bit crazy for drinking it. On the other hand, it saves me so much time. I currently drink Soylent for only about 8-10 meals per week, generally breakfast and lunch during the work week. Pre-Soylent, I spent hours on Sunday prepping my meals for the week or was constantly eating leftovers; either way, I was eating the same thing almost every day. Or even worse, I went out to lunch, spent $10, and ended up getting something that wasn’t very healthy for me. Soylent costs about $1.92/500kcal meal - plus one point for cheap! It’s also pretty well balanced nutritionally, so I know I’m getting a decent amount of nutrients per meal. The other benefit is it’s bland taste… it’s hard to describe, but I just don’t even think about it. Since I don’t think about it, I don’t get sick of it. Overall, I like it and I’ll probably keep ordering it for the foreseeable future. Relevant to all of you programmers out there considering switching to the nerd smoothie. One of the projects I’m working on is in Perl. Having never touched Perl before, this is a bit of a new adventure! Today I had to sanitize a field being passed by a url. This took me a few google searches before I found the right answer, so I’m going to write down the solution really quick here so I don’t forget it. Then you can print your $encoded_message out in html and you will not be vulnerable to XSS attacks. I literally just looked at Perl for the first time today, so any tips are welcome!